NASA’s CYGNSS mini-satellites will collect wind speed data directly over the eye of cyclones. Photo courtesy of NASA. The Southwest Research Institute (SwRI), in partnership with the University of Michigan and NASA, will launch an array of satellites in November that will provide the most detailed observations of the inner core of hurricanes ever collected. Thursday morning it unveiled the satellites and its deployment module to reporters at the Southwest Research Institute in San Antonio. Since 1990, forecasts of hurricane courses improved by about 50% because of better data sets, including those from satellites. In that time, however, scientists still struggled with predicting hurricanes’ strength. NASA’s new CYGNSS mission (Cyclone Global Navigation Satellite System) will use eight satellites in a coordinated constellation to monitor and predict rapid changes in hurricane intensity. CYGNSS will launch in November, deployed from a Pegasus launch vehicle which drops off a high flying airplane before firing into the upper atmosphere. For a gut-wrenching five seconds, CYGNSS will drop like a stone from the aircraft before its initial boosters ignite to bring the devices to their intended orbit. From there, all eight mini-satellites will separate from the module and adjust their speed slightly to get into the proper formation. Dr. Chris Ruf, CYGNSS principal investigator, was asked if he regarded the device’s launch as the light at the end of a tunnel. CYGNSS, unlike previous hurricane monitoring methods, can accurately measure wind speed from Earth’s orbit. The satellites can determine the intensity of the wind from the roughness of the water, which they gather by measuring how scattered the GPS signals that reflect off of the ocean’s surface are. The measurements are taken continuously as the CYGNSS constellation orbits the planet, and they are completely unaffected by the intense rainfall that has made hurricane measurements difficult in the past. The only way to get accurate wind speeds from hurricanes now is to fly a plane with special sensors on board – nicknamed Hurricane Hunters – straight into the eye of the storm. Apart from danger and expense, planes aren’t optimal because they’re rarely deployed to the Pacific Ocean, where cyclones and typhoons crash against Australia and Asia. CYGNSS will take the same amount of constant data globally, improving storm predictions and potentially saving lives all over the world. Each of the eight satellites weighs around 65 pounds and operates on less than 60 watts, which is comparable to a dim light bulb. The program cost around $150 million and will operate between two and six years. Data will be gathered every hour of every day. 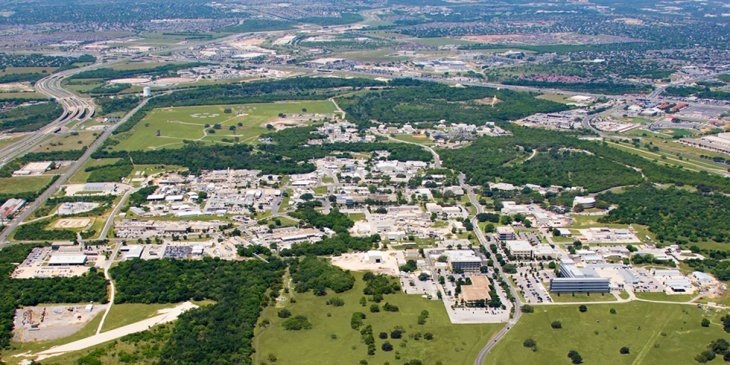 The satellites were designed and built in San Antonio at the Southwest Research Institute’s Space Science and Engineering division. The mission is hardly the first NASA project that SwRI has taken on. Its hardware on Juno is currently orbiting Jupiter and has already yielded amazing scientific discoveries like the first evidence of heat created from acoustic waves and canyons filled with liquid methane on Titan. SwRI also worked on New Horizons, which passed Pluto last year and provided the first detailed photographs of the former planet, revealing flowing pools of liquid nitrogen and a thin blue atmosphere. The institute even created the tempur aircraft brake pads that evolved into Tempur-Pedic mattresses. The Cyclone Global Navigation Satellite System (CYGNSS) will help improve hurricane track, intensity, and storm surge forecasts. Photo by Kathryn Boyd-Batstone. Space Science and Engineering is just one of ten divisions at the institute. It also work on fuels, lubricants, ballistics and explosives, autonomous vehicles, and chemical engineering, among other subjects. In total, it employs more than 1700 San Antonians with an additional 70 workers based in Boulder, Colo. The facility in Boulder will function as operational headquarters for the implementation of the CYGNSS mission. Every piece of data from every NASA Earth Science mission is offered free of charge to anyone who seeks it, and the hurricane data from CYGNSS will be no exception. “From the viewpoint of science, the more people you have looking at it, the better we understand the planet we’re jointly living in,” said Christine Bonniksen, NASA’s Earth Sciences division program director. That means the city of Houston will become safer just as impoverished towns in the Philippines will. Delicate space nets. Probes landing with the force of a bomb. Ice-burrowing tunnellers. These are a few of the robots poised to grab the baton from NASA’s Cassini orbiter in the search for alien life on Saturn’s icy moon Enceladus. As Cassini prepares for a death dive into Saturn next year, planetary scientists met in Boulder, Colorado, last week to discuss its possible successors. Enceladus has a massive global ocean under its frozen surface, and cracks in its exterior spew plumes of water into space. The plumes continually add icy material to one of Saturn’s rings, and offer a tantalising taste of the water within. But Cassini can’t test them. Its instruments aren’t detailed enough to analyse the water, because when it was built, no one knew the plumes were there. As Cassini flew through Enceladus’s plumes a handful of times in the past 11 years, its instruments were flooded with hydrogen molecules, which are a possible smoking gun for hydrothermal vents in the oceans. If confirmed, those vents would have major implications for life beneath the ice. But it’s unclear whether the hydrogen molecules came from Enceladus or from Cassini itself. That’s because when ice grains in the plumes smack into Cassini’s instruments they break apart, like insects on a car windshield. “They are smashing so fast that they can actually chip the windshield and form tiny craters,” says Bouquet. This releases titanium into Cassini’s instruments, which steals oxygen from the icy water to release hydrogen molecules. At the meeting in Boulder, Bouquet presented computer simulations he is using to figure out how much water is really there and how much is the instrument’s confusion – although he hasn’t come to a conclusion yet. 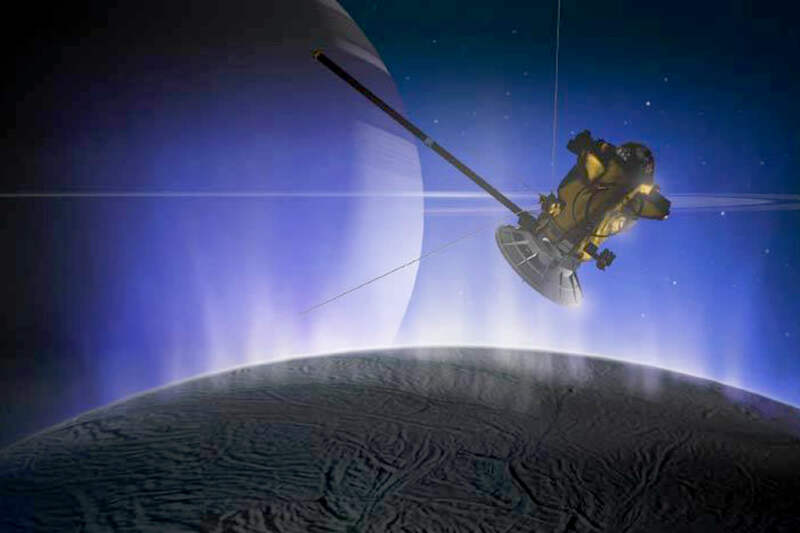 To improve matters, a future Enceladus plume sampler could use gold sensors, which wouldn’t react in the same way as the titanium ones. Or it could use a soft, spongy net, similar to the capture devices developed for the Stardust mission, which grabbed a few specks of cosmic dust from interstellar space in 2006. A net about 12 square centimetres in area would be big enough to capture a few micrograms of plume spray, says Richard Mathies, a chemist at the University of California at Berkeley. While that’s not a lot, the proposed lab-on-a-chip Enceladus Organic Analyzer — new details of which Mathies’s collaborators presented in Boulder — can sniff out one organic molecule in a billion others, Mathies says. Landers and drills would be able to get an even closer look at the subsurface sea. But to enter they would have to crash with immense force or melt the ice, disturbing anything living there even as they tried to detect it. Tests on the EOA’s instruments suggest it could still do its job after an impact with an energy 50,000 times greater than Earth’s gravitational pull, which is a greater g-force than that felt by an artillery shell. At the meeting, Amanda Stockton at the Georgia Institute of Technology presented design concepts with optical instruments in the centre of a lander, which would make them more likely to survive impact. One other robot concept could break more than just ice grains. A proposed Enceladus Explorer mission could set up a robotic base station near the moon’s southern pole, where the plumes are thought to originate. A robot drill called the IceMole would both melt ice and ram through it, reaching down about 100 to 200 metres to the ocean below the surface. Researchers at Aachen University of Applied Sciences in Germany told the meeting of plans to test a smaller model of the probe in a vacuum chamber under simulated space conditions. Even as they plan future missions, planetary scientists will continue analysing data from Cassini long after it makes its final measurements. Cassini has not only fulfilled its mission, but opened the door to an armada of probes destined for oceans in the outer solar system, says Angela Stickle at the Applied Physics Laboratory at Johns Hopkins University in Baltimore, Maryland. Gemini observations show that the thin atmosphere of Jupiter’s moon Io undergoes dramatic changes during frequent eclipses with the giant planet. The following press release, issued by the Southwest Research Institute, explains how the dramatic changes in temperature cause the moon’s atmosphere to collapse. 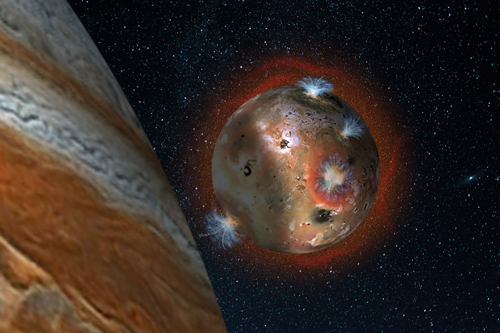 The findings were published in a study titled The Collapse of Io’s Primary Atmosphere in Jupiter Eclipse in the Journal of Geophysical Research. The team used the eight-meter Gemini North telescope in Hawai’i with the Texas Echelon Cross Echelle Spectrograph (TEXES) for this research. A SwRI-led team analyzed data from Hubble’s Wide Field Camera 3 to discover a small, dark moon around the dwarf planet Makemake. The image shows different views of the Makemake system taken two days apart. The moon over Makemake is faint but visible on the left, but completely lost in the glare of the parent dwarf on the right. Southwest Research Institute-led team has discovered an elusive, dark moon orbiting Makemake, one of the “big four” dwarf planets populating the Kuiper Belt region at the edge of our solar system. The findings are detailed in the paper Discovery of a Makemakean Moon, published in the June 27 issue of Astrophysical Journal Letters. The authors of this paper were supported by a grant from Space Telescope Science Institute (STScI), which conducts Hubble Space Telescope operations. The Association of Universities for Research in Astronomy Inc. in Washington, D.C., operates STScI for NASA. The Hubble telescope is a project of international cooperation between NASA and European Space Agency. NASA’s Goddard Space Flight Center in Greenbelt, Md., manages the telescope. Immediately after its 2008 launch, NASA’s Interstellar Boundary Explorer, or IBEX, spotted a curiosity in a thin slice of space: More particles streamed in through a long, skinny swath in the sky than anywhere else. The origin of the so-called IBEX ribbon was unknown – but its very existence opened doors to observing what lies outside our solar system, the way drops of rain on a window tell you more about the weather outside. “Only Voyager 1 has ever made direct observations of the interstellar magnetic field, and those are close to the heliopause, where it’s distorted,” said Zirnstein. A feature of the Kuiper Belt known as the “kernel” has yet to be adequately explained by solar system formation models. In a recent study, a theorist at the Southwest Research Institute proposes a new explanation for how Neptune arrived at its current orbit — and how this planet’s migration in the early years of the solar system might have created the kernel. The kernel is a concentration of orbits within the Kuiper Belt that all have semimajor axes of roughly a ≈ 44 AU, low eccentricities, and low inclinations. How this collection of objects formed — and why they exist where they do — is difficult to explain with current models, however. Kernel objects aren’t in resonance with any of the larger bodies, so why are they concentrated at that specific distance? In this study, David Nesvorný proposes that the kernel resulted from Neptune’s outward migration through the solar system. In the currently favored model of our solar system’s formation, the outermost gas giant planets formed closer to the Sun and then migrated out to their current locations. Nesvorný ran a series of simulations of this migration to test the theory that a discontinuity in Neptune’s movement outward — i.e., a sudden jump in the planet’s orbital distance — could explain the presence of the Kuiper Belt’s kernel. Researchers at Southwest Research Institute (SwRI) and Queen’s University in Canada have unraveled the mystery of how Jupiter and Saturn likely formed. This discovery, which changes our view of how all planets might have formed, will be published in the Aug. 20 issue of Nature. “The timescale problem has been sticking in our throats for some time,” said Dr. Hal Levison, an Institute scientist in the SwRI Planetary Science Directorate and lead author of the paper. Titled Growing the Gas Giant Planets by the Gradual Accumulation of Pebbles, the paper is co-authored by SwRI Research Scientist Dr. Katherine Kretke and Dr. Martin Duncan, a professor at Queen’s University in Kingston, Ontario. Editors: An image is available at http://www.swri.org/press/2015/planetary-pebbles-building-blocks-large-planets.htm. In just a few weeks, a tiny space probe launched in 2006 will finally reach it’s destination — Pluto. The New Horizons spacecraft will be the first to fly by the dwarf planet located in the outskirts of our solar system. In mid-July, the probe will give scientists their best view of the icy object and it’s moon Charon, and will collect data that could help them understand how planets form. A group of scientists at San Antonio’s Southwest Research Institute are playing a big role in the historic mission. When the New Horizons probe was launched nine years ago, Pluto was still a planet. Before the end of its first year in space, the ninth planet was demoted to dwarf status, but don’t think for a second that has diminished the excitement scientists at SwRI are feeling right now. The probe is expected to make its closest approach to Pluto on July 14 and then continue on, exploring Pluto’s galactic neighborhood known as the Kuiper Belt. The probe is the fastest spacecraft ever launched from Earth and is no larger than a grand piano, but its mission could produce some big results. Two instruments on board New Horizons that will help unlock Pluto’s secrets were designed, tested and built at SwRI in San Antonio. One of those instruments is called SWAP and it’s job is to measure the solar winds at Pluto. “That tells us about how fast Pluto’s atmosphere is escaping, how it interacts with the solar wind tells you how much atmosphere is coming off Pluto,” Gladstone said. Principle scientist Michael Davis was involved in the design and building of the second San Antonio built instrument known as ALICE, an ultraviolet spectrometer. Davis said his main role is making sure all the instruments are working properly and helping to analyze the data as it comes in. It’s a big responsibility but he’s confident everything will work as planned. Just like everything else with the mission, scientists will have to be patient for the data to make it back to Earth. The probe will keep traveling past Pluto and out of the solar system, only the fifth spacecraft to leave the solar system, perhaps solving more mysteries along the way. One thing the New Horizon’s mission will not do is end the debate over whether Pluto should still be considered a planet.